The club’s small fleet cruised and occasionally raced in the upper half of the Lower Thames. Its origin was, therefore, like that of many other clubs, humble.Among the earlier records, is mention in 1866 of a race from Charlton (whither the club had transferred its quarters) round the Ovens buoy, ‘members only to steer.’ In 1872 the club had migrated to Erith, and among that year’s races was one to Margate on August 14. The following year found the club at Greenhithe, and after a short stay it had moved still further down the river to Gravesend, a race taking place in that year (1873) to Ramsgate. In April, 1888, quarters were rented at Ramsgate, and on August 4 there was a Channel race to Boulogne. Owing to the steady growth of the club it became necessary to have permanent quarters. To provide these on the London river seemed to be out of the question. The club bad already gradually moved down the river, and the increase of docks, wharves, factories, chemical works, but, above all, cement works, may be said to have forced yachting out of the Thames proper, to drift into the Medway and Crouch. 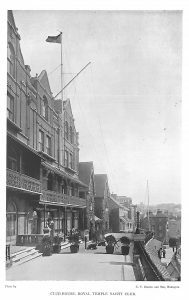 It was natural, therefore, that in 1895 it was decided to circularize the members with a view to seeking their support to a scheme for acquiring permanent club premises at Ramsgate, where these drawbacks did not prevail, and for which place the members seem to have had a long-standing affection. But with the apathy that very often exists in clubs, where the whole fabric is as a rule kept together by the energies of the few, only twenty members showed practical interest in the matter. These few guaranteed sufficient money, and a freehold was acquired, with the result that on May 30, 1896, a club-house was opened on the West Cliff by Lord Charles Beresford, C.B. (then Rear-Admiral). From this time the club came rapidly to the front.Baron Ferdinand de Rothschild was elected Commodore in 1897, and the title of ‘Royal’ was conferred on the club shortly afterwards, while in 1898 permission was granted by the Admiralty to wear the blue ensign. On the untimely death of the Baron in the same year, Lord Charles Beresford, C.B., once more showing his interest in the club, became Commodore, which post he occupied until 1902, when, on account of his increasing responsibilities in the Fleet, he felt it his duty to retire, and the present Commodore, Sir W. Seymour King, K.C.I.E., M.P., was elected to the vacancy.The club won and twice successfully defended the Coupe de France, and in 1903 gave a race from Heligoland to Deal, in which the German Emperor’s yacht Meteor competed.